Natuzzi Editions Gaspare electric reclining corner sofa. The Gaspare from Natuzzi Editions is one of the latest models from the new 2018 range with up and down electric headrests combining high back comfort when the head rests are raised with low back sleek European styling when lowered. This sofa is upholstered in full limestone craftsman high grade genuine Italian leather for a luxurious feel. Featuring beautifully sculpted chrome feet with side details. 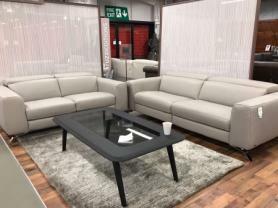 This sofa is available to order in any Natuzzi leather and seating combination you desire. Measures as photographed: 280cm x 260cm.